Wireless pushbutton actuator dimming TF-TA55DL without N connection. For single mounting 80x80x15/33mm or mounting in the 55mm switch system. Pure white glossy. With Power MOSFET. 230V incandescent and halogen lamps up to 200W, depending on ventilation ­conditions. Energy saving lamps ESL and 230V LED lamps in ‘trailing edge’ mode up to 200W or up to 40W in ‘leading edge’ mode, depending on ventilation conditions. Min. load 20W at ‘trailing edge’ mode and 8W at ‘leading edge’ mode. No inductive (wound) transformers. With switching operation for children‘s rooms and snooze function. 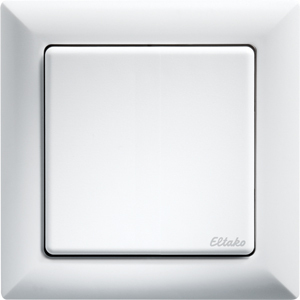 With integrated universal/direction pushbutton and terminals for additional wired pushbuttons. Power supply 230V. Only 0.7 watt standby loss. Smart Home sensor and actuator.